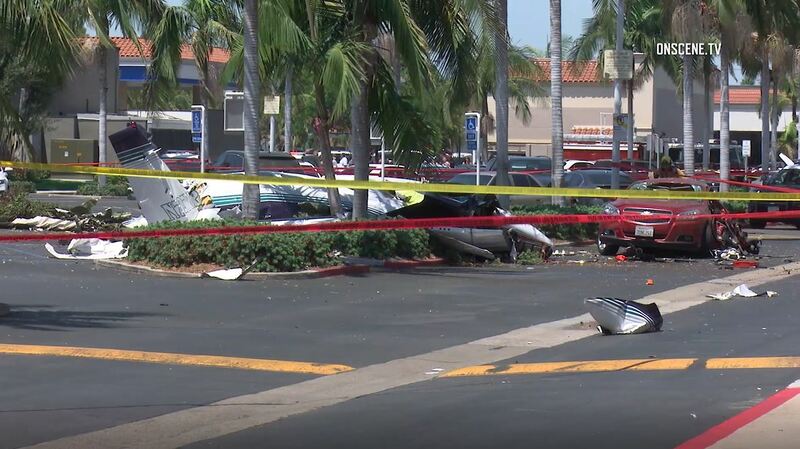 Five people were killed when a twin-engine aircraft crashed Sunday in a shopping center parking lot near the South Coast Plaza mall in Orange County. No one was hurt on the ground as the twin-engine Cessna 414 aircraft clipped an unoccupied car, because “fortunately, that person was inside the store shopping at the time of impact,” Orange County Fire Authority Capt. Tony Bommarito said at a news conference. The plane went down at about 12:30 p.m. into the parking lot in the 3800 block of South Bristol Street shared by a Staples, a CVS pharmacy, a Michaels’ decorations store, and a Wells Fargo Bank branch. The nearby intersection of Sunflower Avenue and Bristol Street was closed in all four directions as National Transportation Safety Board and FAA investigators scrambled to the crash just northeast of South Coast Plaza on the Santa Ana portion of its boundary with Costa Mesa. That intersection remained closed Sunday evening. The crash happened about a mile northwest of the north end of the runway at John Wayne Orange County Airport. The 1973 Cessna was registered to Category III Aviation Corp. in San Francisco according to FAA records, and had been flown from the East Bay suburb of Concord, according to FAA data tracked on the internet. Cessna 414 planes began operations in 1968. They have a range of 1,528 miles and a top speed of 270 miles per hour, according to Internet research. The death toll originally was believed to be three, but was upped to five as firefighters examined the crash. The plane leaked fuel after the crash, but did not catch fire, Bommarito said. Fire crews remained on the scene to clean up the spilled fuel. OCFA Capt. Steve Concialdi told City News Service that Bommarito misspoke when he said the plane was carrying jet fuel. The FAA arrived on the scene about 4 p.m. and the National Transportation Safety Board representatives were expected Sunday evening, Bommarito said. As of 5:30 p.m., OCFA firefighters and coroner personnel had removed all the bodies from the wreckage, Concialdi said.